BTW... while I was nosing about for a forum to try to contact these folks, I ran into a post by a dude who seems to be very competent (though he just barely won Chickamuaga ) and he has posted his games from start to finish of the Union Campaign. Nice reference. From that same forum, a guy posting his "Legendary" level Confederate campaign. Very well done and educational for us beginners. I watched the first battle in the Confederate campaign and noticed that two regiments were stacked on each other and one was firing through the other. That has been changed and you will now see a "blocked" indicator. One of the cool things about the game is that regiments will automatically move into a proper position on the battle line. Like I said... some really nice programming in this game. Just the Battle of Richmond left to finish the Yankee campaign. 1. If you are winning the battle handily, continue to the bitter end and scoop up lots of money and weapons. 2. When charging, charge with at least 2 units vs 1. I like to put up a firing line first, them move a couple regiments just behind them. Give the the charging units an order to move pass the regiment you want to charge and press "double quick." As soon as the charging unit passes through your firing line hit "charge." A few ways to do this. You can select the charging unit and then describe a movement line with the left mouse button held down (not recommended). You can select the charging unit and then with the right mouse button chose a place for them to move which is behind the regiment you intend to charge and third if there is a unit directly behind the intended charge unit but some distance off you can take both units and tell them to move to attack that unit. I normally use the last option if available. 3. Use charge to take positions, use fire to cause casualties. 4. Always keep your artillery close to the battle. Keep moving them up using a leap frog method. Also rename the unit to the type of artillery they are using instead of leaving the name of the unit commander. This way you can see just by looking at the unit what kind of artillery it is. 5. I also rename my cavalry with either "melee" or "skirmish" and do the same with infantry units who have really good rifles so that I don't use them in charges. 6. When you have a unit "fall back" you can use the right mouse button to give them an order where to fall back to but make sure that position has the arrow pointed towards the enemy. This prevents them from falling back in some strange direction and also keeps them from turning their backs on the enemy. 7. Reputation effects the battle, though I am not sure how exactly. Do not use it as a resource unless you have to. The max reputation is 100, so once you get around 80 or 90, use your reputation to buy stuff for sure. 8. Use your recruits to flesh out your regiments, even though it may lower their status. If I have a 1 star unit that is only a tad away from becoming a 2 star unit, but has suffered heavily in a battle, I will take a large amount of recruits that keeps the unit at a 1 star unit (but just barely) and then fill the rest of the units back up to strength with veterans. Money saved goes to better weapons. 9. Always sell crap like shotguns for money but be careful about selling other weapons, especially really good ones. Over time they will mount up and you will be able to upgrade a regiment with basic weapons for a very low cost. 10. In battles where there are a lot of units play the game at half speed until you are pretty sure you have the situation under control. Sometimes also an enemy unit will appear in a strange place and on regular speed you can miss that. 11. Make one of your Corps an elite Corps. Even in battles where you can put up to 5 Corps of men on the map before the battle starts you will be lucky if 2 full Corps make it to the battle. Sometimes it is one Corps and then parts of the other Corps, so make sure you have an elite Corps that you know will make it into the battle. In true fact, I ended up with 2 elite Corps. I think that is a good goal to shoot for by 1863-4. 12. Skirmishers are great to slow the advance of an enemy on the attack. They are also good scouts and are really good at breaking morale when put on the flank of an enemy. Keep them out of the line however, or they will get pummeled. Because they always travel at the "double quick" they are, in combination with cavalry a good fast reaction force if the enemy gets behind you and takes an objective far behind in your rear. 13. I ended up with 30,000 supplies for my Corps and coupled with "logistics" (I think it is) which gives your men more supplies, almost never had problems with out of supply units. 14. By 1864 you should (at least for the Union) have "organization" maxed out at 10. Before you spend your reputation points, look at the upcoming battles. They will give you a good idea of where your organization level should be. That's about everything I can think of so far. 5. Yes. I have learned to have a larger cav unit armed with Sharps carbines to utilize dismounted; several smaller cav units with melee armament for rapid hit/retreat tactics or to take on skirms playing on my flanks and rear. 7. There is increasing morale boost as you hit higher rep points. Put the cursor on the rep number, a box appears to explain rep points. At bottom is % morale boost if you have achieved enough rep to earn same. I have found I need to use rep occasionally to gain additional recruits as the confederates get torn up most battles. 11. Yup. And preferably commanded by RE Lee or WS Hancock respectively. Commanders make a huge difference down to the brigade level. 12. The proper use of cavalry and skirms is many times more critical than the larger units. Good use of both can turn the tide during a battle. During the Fredericksburg assaults, I used same to annoy artillery, wandering supply wagons which in turn caused assault troops to delay or turn to address their presence. That said, one good volley from a large infantry unit in range can decimate either. 13. To Lava's point, good use of extra gold is to purchase ammo supplies. Good list. And I am enjoying the game. As challenging as the Brig Genl difficulty level is, not sure how excited I am to attempt Major General and/or Legendary difficulty. Thanks for answering that question on reputation! I'm doing the Confederate campaign now on Major General level, a couple small battles out from Chancellorsville in 1863. Army strength is 42,000 men. Having played the Yankee campaign, I have quite a bit of experience now with how it all works. Nevertheless, one immediately notes that as the Confederacy you are going to be low on manpower. This requires that you work really hard on getting your troops good guns. At this point in 1863 I have one unit with the Lorenz, one with the Springfield M1861 (a very good weapon which I bought using Rep points) and for the most part the rest are armed with the Springfield M1855. As soon as possible you need to upgrade your guns because they have at least a 20 meter advantage in range. So get rid of all those Palmetto M1842s as soon as possible and upgrade your weapons. The same is true for artillery. I started with a number of batteries of 6 pdr's and Napoleon's. As you get deeper into the campaign you are going to need longer range artillery. I moved as quickly as possible to the 10 pdr Ordnance and the 10 pdr Parrot. Having a battery of howitzers is good too as they work well in forested maps and against fortifications. Watch your inventory as the number of better guns will slowly increase. Once you have enough, you can replace your batteries with better guns for almost no cost. At this point I have 3 Corps, but really only use/need 2 of them. Right now, I put my "specialty" units into the third Corps. What I try to do is match my forces for the map I am going to play on. So, for maps that have lots of forest, I will bring less artillery and more skirmishers (who are my eyes). For more open maps I will bring more artillery and cavalry (who are my eyes) and leave the skirmishers behind. I also have a skirmish unit with scoped rifles (which again I think I bought with Rep points) and they are always on the battlefield as they have the longest range of any rifle available. For Career Points, I have maxed out Politics, have Recon up to 4 (that is the point where you get to see how many troops from both sides are on the field and what losses are being taken) and am now working on Economy, Medicine and Training... which I think is up to 5 now on each. This has given me more money than troops so it really pushes me to buy good weapons and veteran replacements. About a third of my regiments are 2 stars now and very close to 3. As in the Union campaign, I try to have infantry regiments around 1500 men. 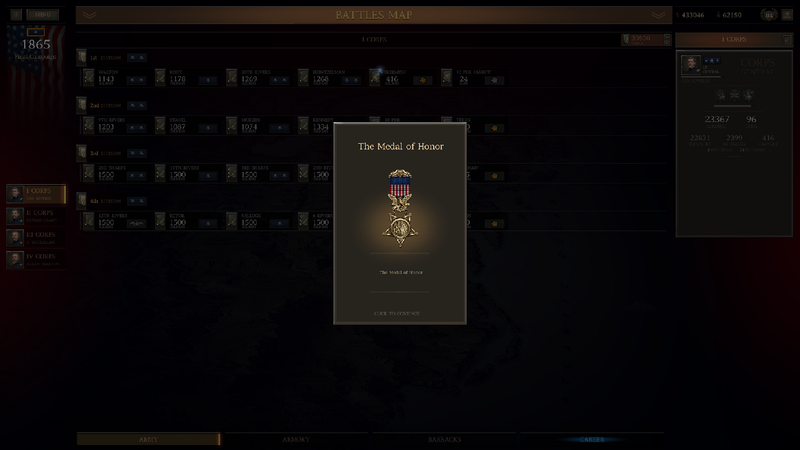 I like that number because, IMO, 2000 man regiments are just too big given the maps which make it difficult to use the terrain well and put at critical points in the battle 3 regiments against 1. I also tend to put my best troops in the first Division of a Corps with my worst in the 4th. At this point in the Campaign, if I need to, which I will at Chancellorsville, I will have 2 Corps with the first 2 Divisions with 2 star regiments in them. I noticed in the game that when reinforcements are brought on during a fight, they normally come in from the second Corps in order... so 1st Division, followed by 2nd Division, etc. Thus, having your best regiments in the first and second Divisions, ensure that they get into the fight fast. Overall, each Campaign has its own unique path. With the Yankees I was pushing (because the game generally forces you) to have 3 full Corps. With the Yanks, I pushed hard to have an elite Corps as soon as possible. With the Rebs, I now have pretty much 2 Corps and they are both essentially elite, though my Corps commanded by General Lee is more elite than the other. After Chancellorsville I have a feeling I will have to move to 3 full Corps. Not quite sure how I will handle that, so we shall see. Great gaming though... very thoughtfully made game which requires a very thoughtful approach and good skills on the battlefield. I am closing in on finishing the Confederate campaign. I am preparing for the Battle of Cold Harbor. Intell says I am facing a Union Army between 63-68K (I believe the real battle was somewhere around 120K). So we'll have to see what happens. I am bringing an army of 64K and 144 guns. As the Confederates, it is very important to maintain a well trained and equipped army. The worst weapon I am bringing is the Springfield 1855, the majority are armed with the superior Harpers Ferry M1855 and I have several regiments equipped with the CS Richmond and Springfield 1861 (which is one of the best rifles on the field). 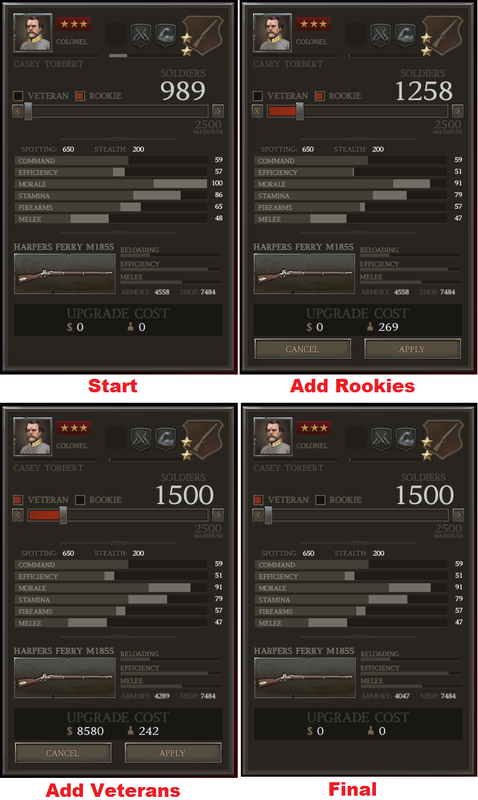 I did a little graphic on how I balance recruits and veterans in reinforcing my brigades to show how to keep the costs down while buying really good weapons. I believe you should try as the Confederate to get most of your brigades up to 2 stars and then leave the majority there. Reinforcing 3 star brigades is just really expensive, though I do have 5 three star infantry brigades. Overall of 36 brigades of infantry 5 are 3 star, 15 are 2 star and 16 are 1 star. I have been recruiting new brigades for the drive on Washington but this will be (Cold Harbor) the first one where all my infantry will see action. My artillery are all 2 star, and my cavalry are 1 or 2 star brigades. The graphic shows how I reinforce a 2 star brigade after a battle to maintain the highest morale and keeping the costs to a minimum so that I can spend the money on stuff like expanding my army and maintaining my 3 star units. The first box is the state of the brigade after my last battle. The second shows how I reinforce with recruits up to the very edge of losing my 2 star status. The third shows me filling out the brigade with veterans and you can see the cost here. The final, is how the brigade looks after finishing reinforcing it. (I am running brigades of 1500 men at 2 star and above and 1700 men at 1 star.) If you look at the first and last boxes, you can see that the quality of most of its characteristics have dropped, but they are still quite high and the brigade will perform superbly. Continuing the Brigadier General difficulty level confederate campaign. Just won Saunders Farm which going in, based on troop count and the objectives necessary to win, I thought would be at best a draw with way too many casualties. I had watched a UG battle video by HistoryGuy and came away with a strategy that I thought might work for Saunders. Saunders Farm requires taking two objectives: holding the farm and then attacking and overrunning the Union encampment located 500 yards or so north. Other than being outnumbered, the difficulty for the confederates is the Union VI Corp arrives on their left flank just as the confederates need to be pushing for the encampment. There is also wooded area surrounding the farm clearing and encampment making progress against oversized Yank brigades tough. So, with nothing to lose, thought I'd attempt hitting them in the strength. Took the farm, set up defensive positions in the woods behind to include every gun I had. While the Yanks in the center pounded away at that objective, I threw virtually all reinforcements for a flanking movement around their right, which is exactly where VI Corps arrives. The trick was to throw one brigade and 6 skirmish units out into the woods as a screen facing that direction while moving the bulk of the force against the Yank right flank. To make the story short, the Vi Corp bogged down attempting to deal with the screening units while the flanking movement was able to push ahead with no worries being attacked from the rear. It also kept the Yank right from pulling back in time to help due to the heavy woods in that area. Tough fight but pulled it out at the very end. A nice win and another learning experience as to how to be successful playing the game. One additional note: the Chickamauga battle in this game is the most difficult challenge I have experienced playing civil war era on computer. Took 3 tries to finally figure out a tactical strategy to even make a win possible. It is what makes this game fun as well as challenging. One battle requires hard hitting at speed; the next requires patience on defense, absorbing the hits before pushing at the right time. Fun game.